July 25th has probably been the warmest day in Romania, or at least in Bucharest, with temperature exceeding 40 degrees Celsius. Even around 7 PM, the heat didn’t show any sign of giving up, so very few things are more appealing that a pleasantly chilled room at Ginger Restaurant, and a tasting of sparkling wines. 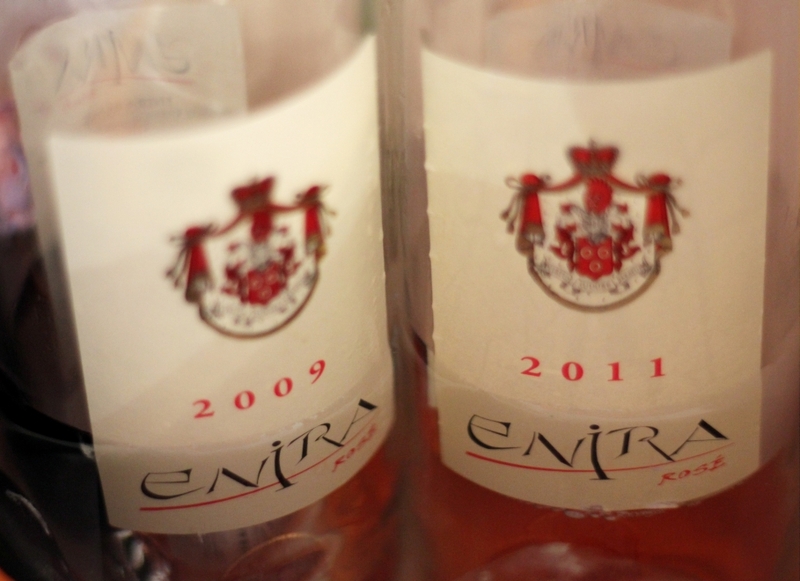 Until the six bottles of sparkling wines, of various origins and vintages were chilling into a bucket of cold water and ice, we enjoyed a face-to-face meeting between two vintages of Enira Rose. Both 2009 and 2011 are blends of Shyrah and Petit Verdot in somewhat similar proportions. Nevertheless, the 2009 is already showing signs of maturity, with notes of cherry and beeswax and the acidity level slightly lower than expected; its younger brother, the 2011 is full of pungent raspberries and sour cherries, with a bit harsh aftertaste, astringent and refreshing. After this wonderful opening, we encountered the first of the six sparkling wines: Chateau Vartely is a well known producer from Republic of Moldavia; its 2008 rose sparkling wine, with 13% alcohol is a blend based on 2007 vintage, the main grape being Sauvignon Blanc. Abundant bubbles, intensity decreasing as minutes are passing, and somewhat artificial notes in the nose, of candy and bubblegum: peach, banana, blood orange. Still, this wine preserves a bit of seriousness in the taste, the high acidity and the pleasant citric aftertase could make it suitable as an opening drink for a laid-back outdoors party. 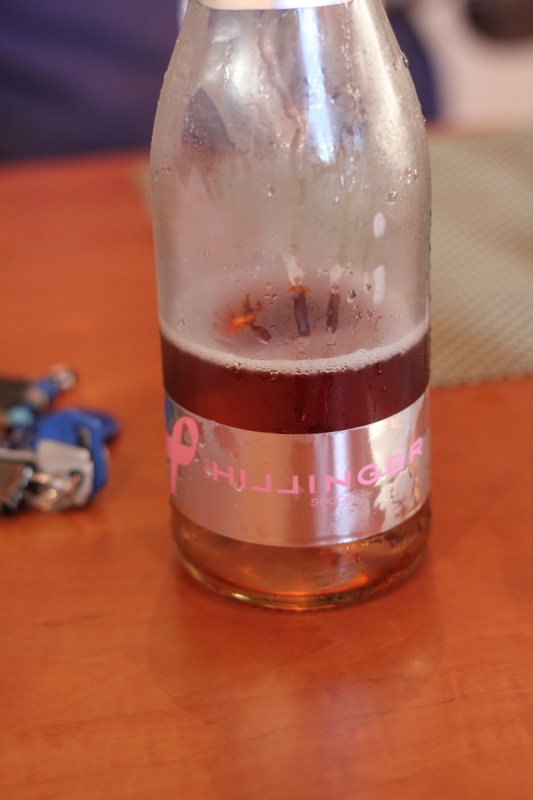 Hillinger secco rose is an Austrian sparkling, with a moderate 12% of alcohol and a blend based mostly on Pinot Noir. 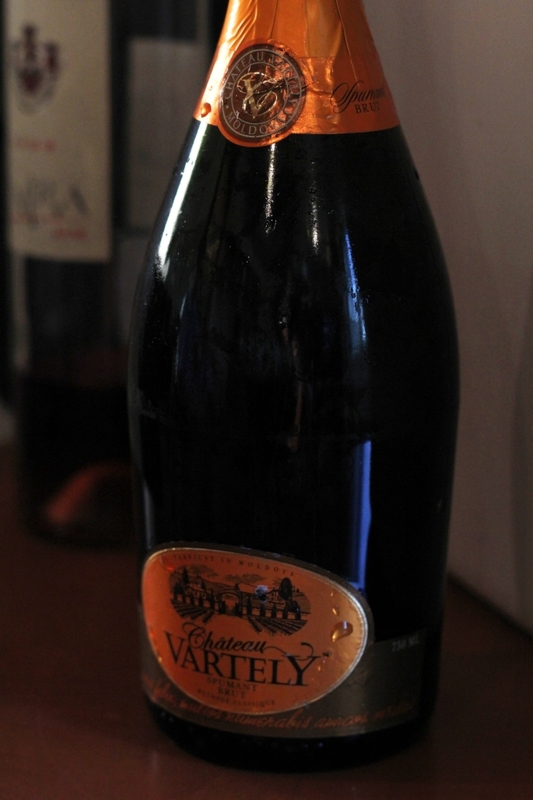 Impressive and catching nose, with abundant notes of ripe fruits and berries, sustained by nice fine bubbles. The mouth-filling taste of grape juice and plums is pleasant but a bit excessive, even though it is sustained by a mild acidity level. Perfect to pair with some light entrees or a simple salad, this wine will not match some serious dishes. 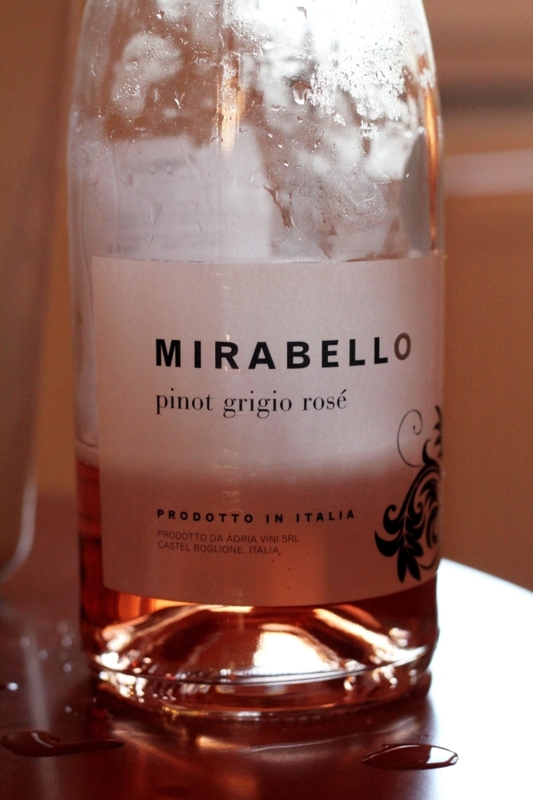 Mirabello rose was a bit of dissapointment. The nice shiny colour did not match the taste, which was somewhat plain, with some heavier notes at the beginning, which opened later into generic notes; also the bubbles were large and hectic. The following wine turned to be quite the opposite. 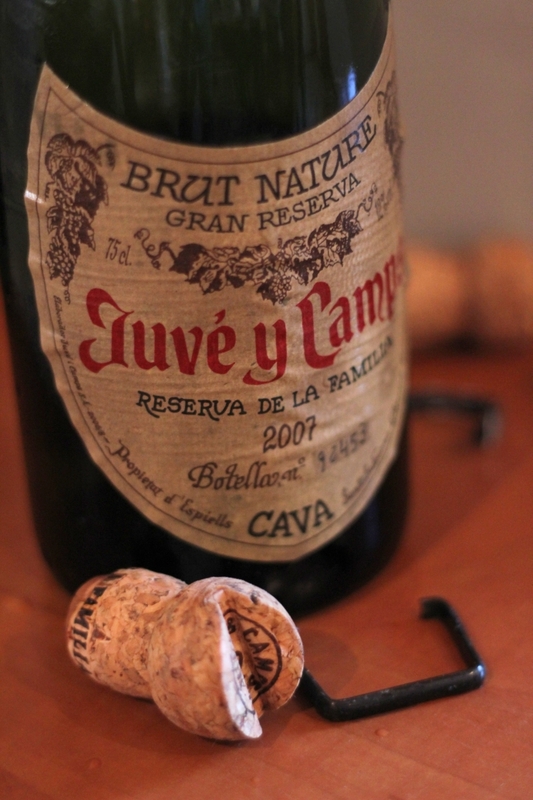 Juve y Camps is a Spanish cava 2007 Grand Reserva, brut nature, with 12% of alcohol. Its fine and delicate bubbles, shaped like small pearls, are announcing an austere and chalky nose, with notes of graphite and concrete, only later a delicate almond note delights the nose. The mild level of acidity highlights the tangy notes of pear, melon and honeydew, while the aftertaste turns a bit citric. This is a wine with a restrained elegance, fitted for seafood dishes. 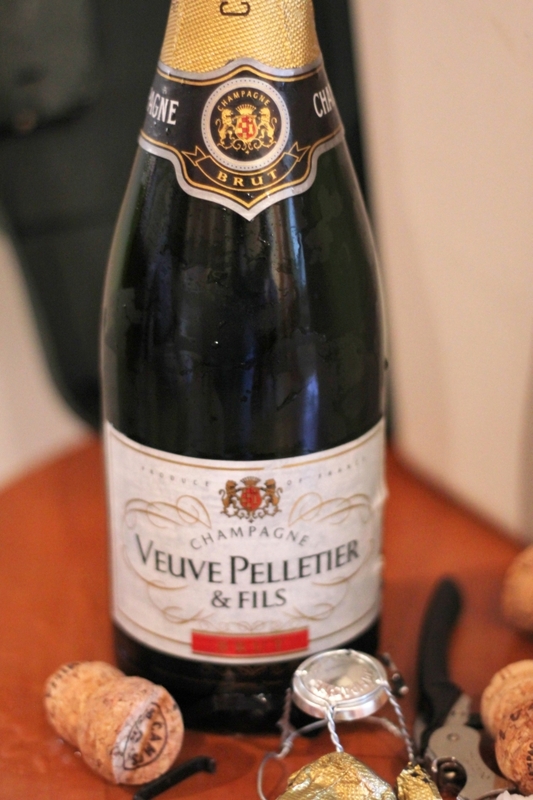 Veuve Pelletier & Fils is a Champagne house form Epernay, blending the traditional grapes of this region: Chardonnay, Pinot Noir and . 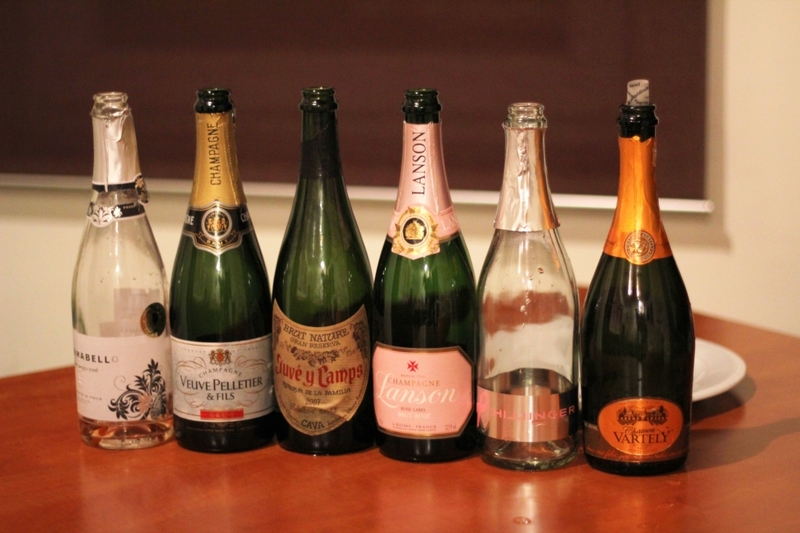 We tasted their Brut Nature with 12% alcohol, and admired its small and consistent bubbles and shiny colour. It also displayed a most typical nose, of freash bread, biscuits and Golden Delicious apples. In the mouth it is not too fruity, the main sensation being the mineral acidity, refreshing and elegant, while in the aftertase linger some surprising grape and kiwi notes. To my mind this wine was the highlight of the evening. 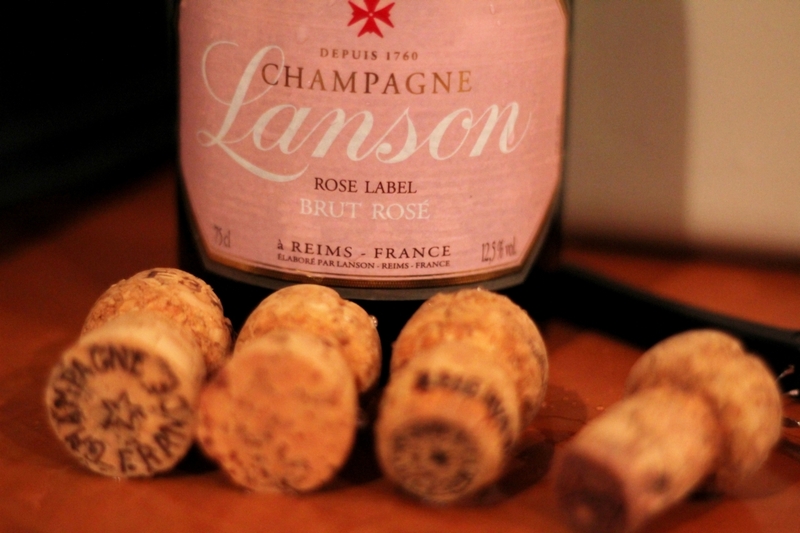 Not the least, Lanson rose Brut is also coming from Champagne, and points 12.5% of alcohol. The bubbles are small and nicely shaped, but much less abundant than the previous wines. In the nose, the „baked” smells are blended into fruity notes -pomegranate and melon. Some zesty fruits are also populating the mouth, with medium levels of acidity rounding the feel. There is a small turn in the aftertaste towards some greenish-bitter notes, contrasting with the rest of the blend. 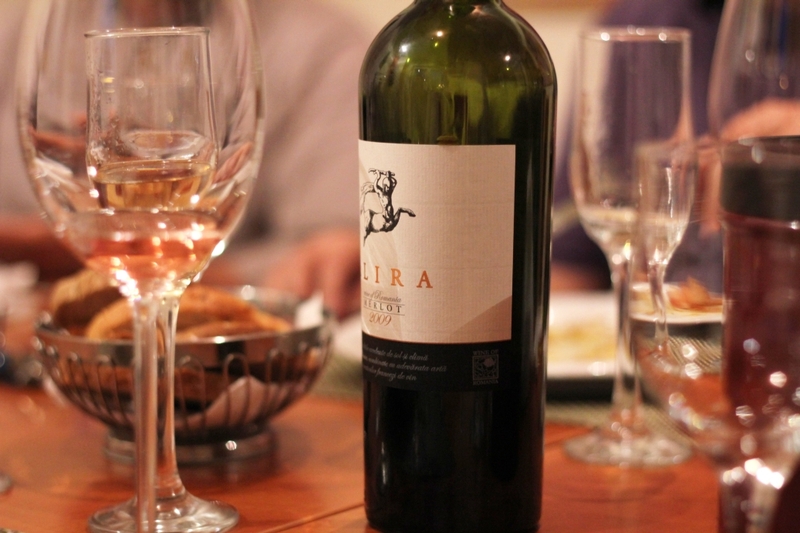 It is easy to imagine that after so much acid ingested, our stomachs were demanding something solid to digest, so a light and tasteful dinner was served, along with a powerful Merlot: Alira 2009, from WineRo. 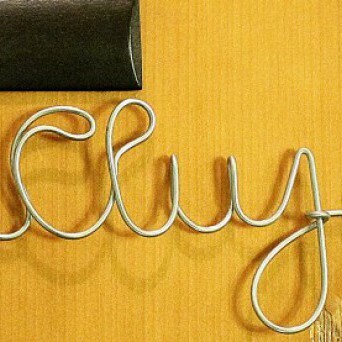 The wine has changed since my last tasting (more than a year ago), becoming more „educated” and elegant. Its dark garnet robe has become more velvety, and the nose is less tannic, making room for more developed notes: cranberry jam, plums and licorice, with a fine hint of vanilla. 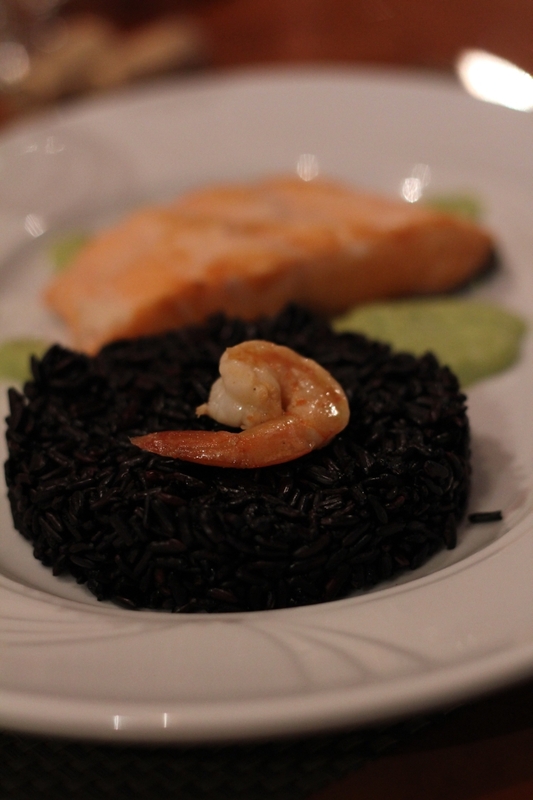 In the mouth it is nicely rounded, chewy without being heavy, with mild tannins and a youthful base touch of peppermint. Spicy and peppery notes mark the ending, quite unexpectedly, shifting the attention from the ripe fruits towards the pungent feel on the throat. Even if there still were well over 20 degrees outside, this wine somehow blended perfectly with the ending of the evening. Această înregistrare a fost postată la 27 iulie 2012 de Mihai Oprea în Evenimente si colaborari şi etichetată Alira, cava, Chateau Vartely, degustare spumante, Enira rose, Ginger Restaurant, Hillinger secco, Juve y Camps, Larson rose, Mirabello rose, sparkling wines, Veuve Pelletier&Fils, wine tasting.